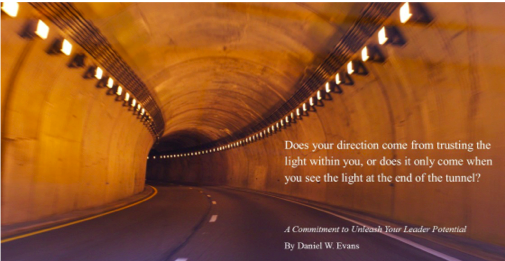 Are you only focused on seeing the light at the end of the tunnel or do you see the light that is within you? We need to be enlightened to the treasure of potential deep within each of us. Meditate upon the simple truth in this statement. We have what it takes to be what it takes to influence our part of the world. The book, “A Commitment to Unleash Your Leader Potential,” discusses four areas of leadership influence and breaks them down for easy identification. When the four areas of your own influence are identified it is much easier to define and refine your skills. Becoming actively involved in the Law of Reflection helps you examine your experience for clarity. Your experience will enlighten you to the truth of your skills and limitations. This knowledge equips you to identify your positive and even your negative impacts in all four areas. This process helps you become a better influencer, which in turn will grow your tribe or following. Let’s review the definitions of the words experience and leadership to see how they jointly play a role in leadership and personal success. The word experience means knowledge or practical wisdom gained from what one has observed, encountered, or undergone. While the word influence means the action or process of producing effects on the actions, behavior, opinions, etc., of another or others. You should already be able to see by the definitions the importance of drawing from your experience to increase positive influence. In addition, we can learn from these definitions that it is important to know your mentors and other close associations. What you learn from these associations will be applied to your everyday interaction with people. Whether your knowledge is innate or learned it will surface. Be careful when selecting mentors and those of your inner circles. I am a person of faith and I believe this truth, “bad company corrupts good character.” If you desire to add value to others by influencing them positively you must receive constant deposits of the same. A cardinal leadership rule of mine is what you scoop in is what you will dish out. The scooping ratio must be greater than the dishing out for you to produce satisfactory results. Our experience is a very important element to our influence. What we experience within ourselves, among others, and through life’s circumstances is a teacher to our influence. How we interact with others is based upon our thinking and our thinking is determined by what we have learned. Let’s review the three ways of within, others and circumstances that shape our experiences, which in turn shapes our influence. Within – How we feel, what we think and what we have learned are ingredients to how we interact to others and circumstances. They affect the inner workings of our minds. We should intentionally work at maintaining a healthy level of thinking, because our thoughts affect our emotions. Our thinking mixed with emotions determines how we react to others and circumstances. Investing in personal growth also plays an important role in gaining knowledge that can assist in the mental process of thought and emotional management. No one has the ability to read minds. However, our responses indicate what may be anchored deep within us, which if not beneficial to us will need uprooting. This is accomplished by adding positive knowledge that produces change to our inner being. Others – The people we have positioned in our lives influences us more than we may admit. We learn from their influence. If their influence is negative based upon a lack of knowledge and bad experiences, this is what we have to glean from. We did not have a choice where we were born and to whom, but we do as we grow and develop into independent individuals. We influence people more than we realize. This is the reason we must be aware that we are impacting the lives of others. Awareness can start the process of assessments of our own experience and influence. Review the status of your mentor and inner circle relationships that is not favorable to your progress and success. Engaging to produce positive change within ourselves also helps our status of being a better influencer to others. Circumstances – The first thing to learn about circumstances is that bad things happen to good people. If this is true, the best thing for us to do is minimize bad circumstances. The only person you have complete control over is you. That is true for us all. If circumstances is a teacher and affects my influence, then I must be the owner of my own experiences and control them and also how I remember them. It also involves perspective. Others in my life and of course, my own knowledge, help create the experiences needed to form positive influence. It is my decision to choose my associations and gain the knowledge I need to accomplish this goal. By maintaining control over my thoughts and emotions a different perspective is created. One that will help me perceive any circumstance as a teacher offering an opportunity to learn from it instead of considering it as being only a hindrance. Always remember that your experience is a key element in determining your influence. In a world full of influences, make sure your influence is impacting your part of the world in a positive way! Definitions for the words experience and influence were taken from http://dictionary.reference.com.